The experiment is published. All I need now is your opinion. Do you prefer a long read to a short read, yet find it hard to squeeze a novel into your schedule? This is how I often feel. I like to see characters change over time, and I like the additional plot depth of a novel. But, I don’t always have time for it. That dilemma led to my experiment. Short stories, each with a satisfying conclusion to its own plot, that link together into a larger story with all the depth and complexity of a novel. 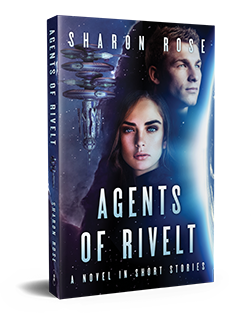 I offer you Agents of Rivelt – A Novel in Short Stories. Are you short on time? Read one story over lunch. Snowed in? Grab a cup of hot cocoa and enjoy the entire book. A couple added bonuses: The ebook novel version costs half the price of buying the short stories individually. The novel version is also available in print. Click the cover to see the details. I would love to hear what you think of this approach to storytelling. Leave me a comment below.